With the Olympics less than a month away, United States of Hockey will profile a member of the 2014 U.S. Olympic Men’s Ice Hockey Team almost daily between now and opening ceremonies. Since we’re conditioned as hockey fans to think of these players within an NHL context, this feature takes a longer look at how each player’s skill set and experience translates to the Olympics and the bigger ice surface. Each profile also includes a look back at each player’s national team career and memorable moments or accomplishments while wearing the USA crest. Zach Parise has had a rather decorated career with USA Hockey dating back to when he was 16 years old, shuttling between Shattuck St. Mary’s and the National Team Development Program for their international events. As part of the 1984 birth class that essentially sparked the momentum USA Hockey has experienced over the last decade-plus in terms of player development and international success, Parise has played a pretty big role. The last time he wore USA across his chest was in Vancouver at the 2010 Olympics. He of course scored the late game-tying goal that even in a loss will go down as an important goal in USA Hockey history (more on that in a bit). He was one of the fresh faces in 2010, but he’ll return to Team USA a veteran in 2014 and as one of the club’s designated leaders. He could wear a letter in Sochi, perhaps even the C. Regardless of position in the alphabet though, he will be a key player for Dan Bylsma. Parise tied for the team lead with eight points in the 2010 Games and will be expected to produce and provide energy to Team USA’s lineup in 2014. Having already played a featured role at the Olympics, he should be able to step into this squad rather comfortably. The Minnesota Wild star has had a bit of a tougher year and is still recovering from a fracture in his foot. Parise resumed skating Tuesday and is still “a ways away” from returning according to Michael Russo of the Minneapolis Star-Tribune. So that is of some concern. Parise is expected to be back before the Olympics, but if it takes him a little while longer to get in the swing of things, it could impact Parise’s effectiveness. He’s still a tough player and even if not 100 percent, should still be able to contribute in a sizable manner, though. Prior to the injury, Parise put up 27 points in 37 games while averaging more than 20 minutes of ice time a night. What he brings to Team USA: There are few players in the National Hockey League that are as tenacious as Parise. Despite lacking great size, he goes to all areas of the ice, is relentless in puck battles and is capable of winning races to pucks or to the good scoring areas. As effective as he is on the NHL ice surface, his skills all translate very well to the bigger surface. His speed and skill level will get him to where he needs to be and should make him one of Team USA’s most effective overall forwards. It’s been a long time since he played on a European sheet, but he excelled on it in previous World Championship experiences from the U18 level up. Though it was at the younger levels of international hockey, Parise’s prior success on big ice is at the very least helpful to him even today. He also played in the WCHA with the University of North Dakota. While UND plays on an NHL sheet, many of the WCHA schools use Olympic regulation ice. So it’s been some time for Parise, but the big ice will not be foreign to him. The thing it seems you can always count on Parise for is a consistent effort every shift. He makes the most of his time on the ice and gets after it pretty good. Having a somewhat blue-collar type of mentality on the ice goes well with his skill level and general offensive talent. He never seems to lack for energy and having a player like that is important. Teams can very easily get lulled to sleep on the bigger ice surface. That could be especially true against a team like Slovakia, who will probably play pretty cautious, calculated hockey. Having a player like Parise who is so relentless in puck pursuit forces the other team to play at a pace they’re not as comfortable with. That forces mistakes and with every mistake made on the bigger surface, there’s a good opportunity to capitalize. You’d expect Parise to be in Team USA’s top-six and more than likely on the top scoring line. He should see power-play time and is obviously a guy you probably want out there in those late-game situations. The U.S. will need Parise to be at the top of his game and playing a key role throughout the tournament. Memorable USA Moment: Well this one is pretty easy. Though Parise was among the leading scorers for his gold medals at the U18s and World Juniors, his coming through on the biggest stage trumps that, obviously. Parise scored with 24.5 seconds remaining to tie Canada in the gold-medal game. Though the end result overshadows this moment, it remains one of the most unforgettable goals in U.S. Olympic hockey history. Of course, it seems weird to reminisce about a goal that was basically rendered meaningless in Canada’s gold-medal victory. But it wasn’t meaningless. His putback with 24.5 seconds against Canada put the U.S. on equal footing with their North American rivals on the scoreboard and somewhat symbolically as well. It may not put the countries on equal footing in terms of overall depth, but it showed that the Americans could compete with Canada, best-on-best. It also represented how far American players had come in the last decade. The U.S. was four years removed from an embarrassing trip to Torino, in which the player pool was so dreadfully thin, they had no choice but to bring aging players to fill out the roster. The 2010 team was a younger group that didn’t nearly match the depth of Canada (Tim Gleason and Ryan Whitney, might I remind you, as replacement D on the roster), but they were miles more talented than the most recent iteration of a U.S. Olympic team. 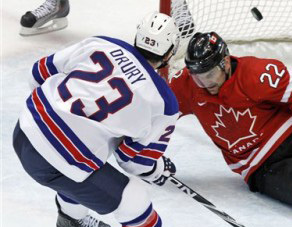 The goal put the Americans a shot away or a lucky bounce away from the gold medal against their biggest rival. The other reason it was so important? An estimated American audience of more than 35 million tuned in for the closing minutes of that game. It was the largest TV audience in the U.S. since the 1980 Olympics. 35 million to watch a hockey game. In the United States of America. That’s not nothing. How often do you get to see Americans all across the country this excited about hockey? It can only happen at the Olympics. I think it’s pretty safe to say that game made more NHL fans out of many people watching. There was so much optimism about hockey, even USA Hockey’s membership saw a larger-than-average bump the following season, topping 500,000 players nationwide for the first time ever. Coming up tomorrow, Ryan Miller.